Commissioning your very own artwork is a wonderful experience for both my clients and myself. I will work closely with you to bring and transform the images you have in mind into an Artwork and heirloom to be enjoyed for generations. 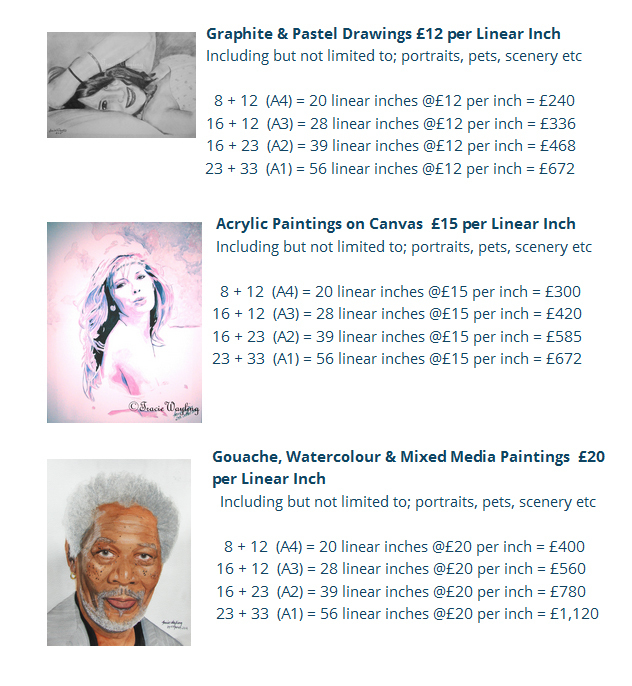 Whether you are looking to commission a single piece or a set of paintings, the choice is yours. Consultations are indepth taking everything into account from the correct size for your wallspace, through to the smallest of details you wish to include in the Artwork itself. For example; you must take into consideration if the piece will be mounted as well as framed which will make your finished artwork larger all round (needing more space than maybe first imagined or a slightly smaller painting), to ensure you are happy with all decisions made before work even begins. NB: It is important to remember, if you a ordering a commissioned piece for a specific date, event or celebration to give as much notice as possible. This will help me to arrange my scheduling in advance to ensure your piece is ready in plenty of time for your special day. Prices are categorised into three most frequently requested groups as shown below. All are priced by amount per linear inch. Linear inches are calculated as width + height x rate rather than the standard width x height measurements as this better reflects the actual time and costs involved in creating each piece. Prices do not include framing, postage or packaging as many clients prefer to arrange framing separately and/or collect the Artworks themselves. Framing and delivery can be arranged separately on request, and it is important to remember to allow extra time for these services if they are required. After a consultation and confirmation of work requested, a non-refundable 40% deposit is required. Calculations and examples for some of the most popular sizes have been included below for easy, at a glance reference.